Around 100 years, although some scientists think we can live up to 200 years! You can find me in the chilly Arctic and subarctic waters year-round. I live in the upper northern hemisphere, including in the Bering Sea and Chukchi Sea. I feed almost entirely on zooplankton, which are tiny non-swimming organisms like copepods and euphausiids. I also like invertebrates and fish. I like to think of myself as the Arctic’s gentle giant. My name comes from the shape of my jaw, which resembles an archer’s bow. 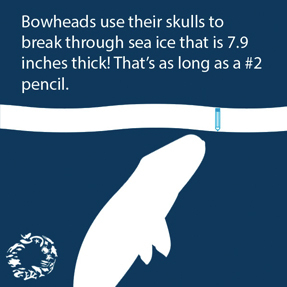 Our skulls can be over 16.5 feet long—about 30-40 percent of our entire body length! I sure weigh a lot!! 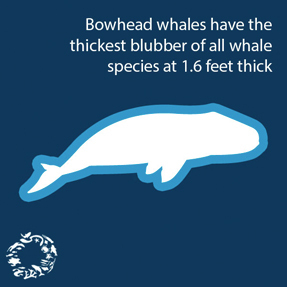 Clocking in at 75-100 tons, bowhead whales are among the heaviest animals on Earth, second only to the blue whale. Instead of teeth, I have about 350 large baleen plates that filter seawater so I can eat small animals, including zooplankton. I don’t like venturing too far from home. Unlike many other whales, I stay in the Arctic all year instead of migrating south for the winter. But, I don’t mind the Arctic cold all year long because I have a very thick layer of blubber that helps me stay warm in the Arctic’s coldest months. I’m considered a loner, spending most of my time by myself. But on rare occasions, I’ll travel with some friends in a small pod. I’m one of the longest-living animals on Earth—scientists believe I can live over 100 years! I love the cold! I spend a lot of my time under the ice. I use my massive skull to break through the ice with my head. Because of my encounters with the ice, I’ve gotten my fair share of scars, but these scars help scientists tell us whales apart. And those scientists need all the help they can get—because we spend so much time under water and ice, we’re pretty difficult to study and track.